Size: Tooth is 6 inches long!! Now this is a striking fossil shark tooth! 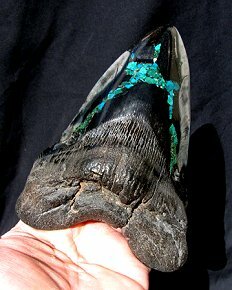 It is a huge Meg tooth from the Extinct White Shark, Carcharocles megalodon. This colorful tooth has chrysocolla polished into the center of the tooth, giving it a rich blue-green color. The black and grey-colored enamel on the edges of the tooth complements the chrysocolla to make for a very beautiful tooth. But the beauty does not end there! The tooth is huge - six inches long! The tooth has the textbook long, arrowhead shape still intact. And the back side of the tooth is extremely complete and very impressive. This is an enormous display Meg tooth for a collection or conversation piece.